Attempts at making peace in the troubled world’s newest state, South Sudan, have been going on and off for the last five years now. The Inter-Governmental Authority for Development (IGAD), has tried and failed; Ethiopia, also, has tried and failed; now Sudan, Kenya and Uganda are at it, too. This week’s meeting at the Entebbe State House was hopefully the one to have brought sanity to the conflicting political and military factions in the country. Not so: almost immediately, after the announcement of a unity government between President Salvar Kiir and his nemesis, former Vice President Riek Machar, the rebel forces inside South Sudan said they would not recognize the formation of the new government. Under the arrangement the provisional government will be headed by President Kiir, with Machar, again, as the First Vice President; then the other groupings would also nominate second and third vice presidents to represent them. In the process, the former First Vice President, Taban Deng Gai, who had replace Machar, was axed. Also removed was another vice present, Wani Iga. Note that, Gai was second to until he ratted on Machar in the Southern Peoples Liberation Movement/In Opposition (SPLM/IO). He then joined Kiir in a so-called unity government which has now been abolished. In the process, Iga has also been got rid of. Not only these, but there are contestants for power in South Sudan who have their own rebel armies. Notable among these are, the former Army Chief of Staff, Paul Malong and former SPLM/A – Sudan Peoples Liberation Movement/Army – intelligence chief, Thomas Cirillo. And there are others spanning the whole country and belonging to the more than 70 tribal groupings, almost each of them having rebel armies and/or alliances. Significantly, Kiir is of the largest Dinka tribe, while Machar is a Lou-Nuer. The stakes are very high. Southern Sudan is oil rich; and political oligarchies are being formed to satisfy tribal acquisitions and sentiments. That apart, there are interests being fronted by the neighbouring regional states that also impact on personal gains through investments in the country. Most of these interests are disguised as trade relations with South Sudan, but a number of these have been revealed as siphoning off the wealth of the country in dubious deals and massive money laundering that leaves the indigenous people at the sidelines. After the suspicious helicopter “accident” of SPLM/A founder, John Garang, and then the independence, the most serious attempt at a political organization was when the various groups were preparing for a national election in 1998. 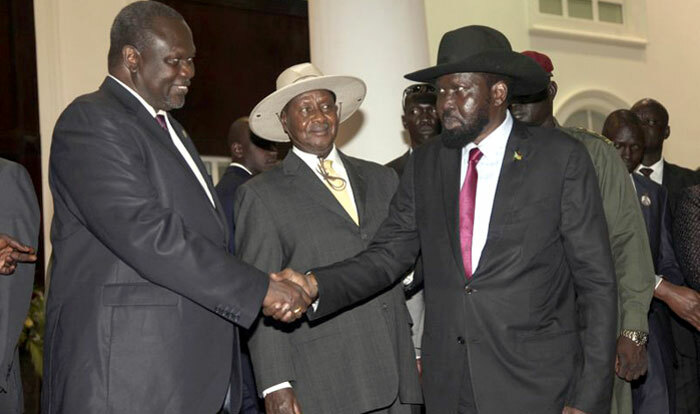 The SPLM got divided between Kiir and Machar, both vying for the elected presidency. Into the nomination for the person to be elected as the one contesting for the chairmanship of SPLM, there developed serious personal rivalry between the two. Needless to say, the one who would have won the SPLM chairmanship would undoubtedly have won the presidency of the country, the other opposition parties being mere sideshows. That ended in a fracas when Kiir out-manouvered Machar, who was generally viewed as the more charismatic figure within the SPLM. It ended in Machar fleeing to Ethiopia and the formation of the breakaway SPLM/IO. The second attempt was in 2003 when fighting erupted between the forces body-guarding the contestants within the presidential compound in Juba. It is the outcome of this fighting that has ended triggering a conflict that has pitched the country into famine, paralyzed public services and forced four million people – a quarter of the population – displaced within South Sudan itself. 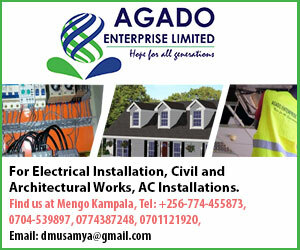 And most of the additional two million people, have fled as refugees into Uganda; and a small smattering of them into the other neighbouring countries. These South Sudan refugees have become political issues of their own in the reception countries. The fighting that ensued between the Kiir and Machar forces in Juba wrought mayhem, in which a United Nations team noted, “destruction everywhere”. It led to more than 500 deaths of the militias of both Kiir and Machar, and the latter’s enforced evacuation, to the Democratic Republic of Congo (DRC), in a month-long march through the forests, to reach Kinshasha. Eventually, Machar ended up in exile in South Africa where he was placed under house arrest until now. Machar has claimed that his confinement is an attempt by Kiir and his backers to emasculate him politically and render him a non-entity for contest for power in South Sudan. This is at the backdrop where many of the top officials from the regime are living up the top of their lives in underhand acquisitions in Nairobi and Kampala; and trying to influence events in the country from these capitals.